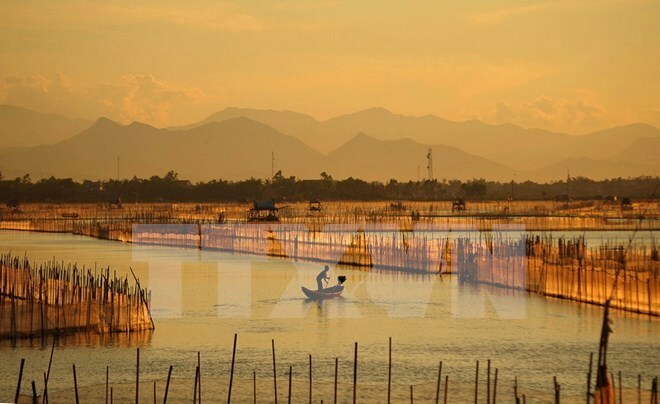 Thua Thien – Hue (VNA) – The central province of Thua Thien – Hue is mapping out a project to preserve biodiversity in submerged lands in Lap An Lagoon and O Lau estuary, which cover a combined over 4,000 hectares and boast rich fauna and flora. Located across five communes in Phong Dien district, the submerged land in O Lau estuary is part of the Tam Giang – Cau Hai lagoon system, and is home to more than 900 fauna and flora species. The area is the annual shelter for around 57 species of migrant birds, including 22 species listed in the category subject to strict protection in the Europe Union’s Red Book. Meanwhile, the Lap An Lagoon, covering around 1,655 hectares in Lang Co town, is separated from other lagoons and lakes in the Tam Giang – Cau Hai lagoon system. Close to 300 hectares of mangrove forests on tidal lands in the west and the east of the lagoon have degraded over time due to climate change. The province’s project aims to establish conservation sites under joint management with the local community, thus increasing awareness about the value of biodiversity as well as their benefits and duties. In fact, the idea to set up a conservation site in the O Lau estuary was initiated eight years ago by the integrated coastal zone management (ICZM) agency, the provincial Department of Science and Technology, and the Department of Natural Resources and Environment. However, it is now developed into a project. Thanks to the support of the World Wide Fund for Nature (WWF), the province’s Community Development Research Centre has grown nearly 10,000 mangrove trees in Lap An lagoon since the beginning of 2016. The People’s Committee of Lang Co town in Phu Loc district has also launched a project on the community-based management and rehabilitation of mangrove forests in the Lap An lagoon.